Sorry - diese Seite gibt's nur auf Englisch ! This site has NO avengers ! Diana Rigg starred in Hammer´s original Theatre of Blood movie in the Seventies. 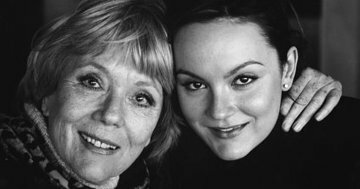 Now her daughter, Rachael Stirling, is reprising the role on stage at the Lyttelton. 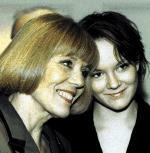 Actresses Diana Rigg (R) and daughter Rachael Stirling leave One Knight Only, a variety performance in aid of the Asian Tsunami Appeal, at the Theatre Royal, Haymarket on March 20, 2005 in London. Information by "a humble admirer of Diana Rigg". Thank You ! Michael Grandage's production of Tennessee Williams' play stars Diana Rigg and Victoria Hamilton. The play begins after Sebastian died the previous summer. His mother clings to him in death as she clung to him in life. In the sultry heat of New Orleans she plans her revenge on the girl she believes stole Sebastian from her. 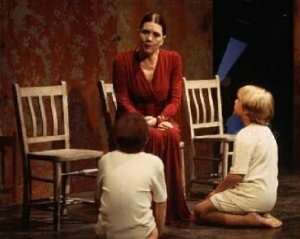 Diana Rigg's recent work includes Humble Boy and Mother Courage and her Children (National Theatre) and Medea (Almeida and New York) for which she won a Tony Award. Victoria Hamilton's most recent work on stage includes A Day in the Death of Joe Egg (New Ambassadors and New York) and Home and Beauty (Lyric). Since the production opened in Sheffield, it has had rave reviews. Another Olivier Award winner, Christopher Oram, is the designer, while the Lighting Designer is Howard Harrison and the Composer is Adam Cork. Victoria Hamiliton, most recently seen in Sweet Panic at The Duke Of York's, has also appeared in both the West End and on Broadway in A Day In The Death Of Joe Egg. 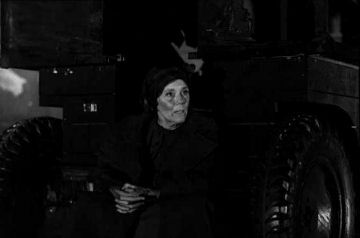 Diana Rigg's most recent stage work includes Humble Boy and Mother Courage And her children (National Theatre). Michael Grandage, who directs the piece, is Associate Director of Sheffield Theatres and recently took over from Sam Mendes as the artistic director of the Donmar Warehouse. You may be interested to know that UK specialist independent label, Harkit Records plan to release Diana Rigg singing "Sentimental Journey" & Forget Yesterday" completely remastered and remixed in September on limited edition 12" vinyl and CD. Danke für Dein Mail! Habe vor kurzem ein recht interessantes Mail bekommen, dessen Inhalt ich Dir noch unbedingt zur Kenntnis bringen möchte. British Stars Sign with ICA for Touring 2002 Icons of the British stage, Dame Diana Rigg and Sir Derek Jacobi will be appearing in an ICA production scheduled for mid-2002.Mounted in association with the Royal Shakespeare Company, the play (to be announced early in the new year) will tour Australia and New Zealand and then to three cities in Asia. The Managing Director of International Concert Attractions Limited, Andrew Kay, met with the two British stars in London last week. "Dame Diana and Sir Derek are looking forward to touring with ICA," said Mr Kay. "They both are aware of our successful tours "down under", and with our soon-to-be-established base in Hong Kong, ICA is able to offer artists of this magnitude the chance to perform in the best venues in this part of the world." Both artists have extensive stage and screen credits to their names, but they are probably best known to audiences in this part of the world for their award-winning television series, The Avengers and I Claudius, respectively. 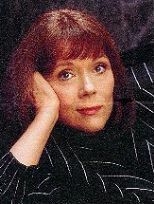 Have just discovered your website on Dame Diana Rigg which we found very interesting. We thought you might like to know that here at London Theatre Tours we have just organised a very exclusive and unique event featuring Dame Diana. On Saturday September 22nd, at a central London restaurant she will answer questions about her amazing career. If you, or anyone else you know, is interested in more details then please do get in touch. http://londontheatretours.com THANK YOU, Tricia ! Hatte Glück. Hab das Stück 2x gesehen. Jeweils 2,5 Stunden Schlange stehen haben sich auf alle Fälle gelohnt. Dame Diana war nicht nur brilliant sondern sieht immer noch sehr gut aus. Die ganze Besetzung war großartig und das Stück ist wirklich intelligent, lustig und berührend. Unter http://www.nationaltheatre.org.uk gibt es nach Anklicken des Bildes 'Humble Boy' unter 'Extra' Bilder von den Proben. Gute Zusammenfassungen der Kritiken gibt es unter http://www.goodshow.com/reports/news_tips.cgi dann Humble Boy ziemlich am Ende anklicken und http://www.albemarle-london.com/rnt-humbleboy.html inkl. Interview mit Diana Rigg. Following their final performances at the Albery, Jonathan Kent's productions of Ph�dre and Britannicus transferred to the Brooklyn Academy of Music, New York from 5 - 17 January 1999. 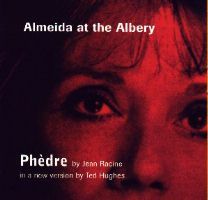 Ted Hughes' new version of Ph�dre opened the Almeida Season  at the Albery, and was joined in repertoire by Robert David MacDonald's new version of Britannicus. Barbara Jefford, Kevin McKidd, Diana Rigg, Joanna Roth and Toby Stephens. Phèdre and Britannicus, as arranged went to BAM. There was pre-show publicity in The New Yorker and New York Times, with photographs and interviews. They were also reviewed by all the major American press. BAM is located in Brooklyn, New York. There are no plans at present for Diana Rigg to perform at the Almeida this year . The programme for the Malvern season this year has yet to be confirmed. New York Times Sunday, 3 January 1999, Arts & Leisure Section, pages 5 & 8, two articles about the plays.Thursday, 7 January 1999, Section B, pages 1 and 5, "Phedre" review; and an article about the BAM spring season. Monday, 11 January 1999, Section B, pages 1 and 5, "Britannicus" review. Sunday, 17 January 1999, both reviews. USA Today Thursday, 7 January 1999, Life section, "Phedre" review. New York Post Thursday, 7 January 1999, "Phedre" review. Sunday, 10 January 1999, "Phedre" review. Monday, 11 January 1999, "Britannicus" review. New York Newsday Thursday, 7 January 1999, Section B, pages 2 and 11, "Phedre" review; and an article about Greek drama. Monday, 11 January 1999, "Britannicus" review. New York Daily News Monday, 11 January 1999, both reviews. Variety magazine 11 January 1999, Legit section, "Phedre" review. 18 January 1999, Legit section, "Britannicus" review. Village Voice newspaper 19 January 1999, "Phedre" review. 26 January 1999, "Britannicus" review. New Yorker magazine 11 January 1999, photo of Dame Diana and Toby Stephens. New York magazine 25 January 1999, both reviews. Hollywood Reporter 12 January 1999, "Phedre" review. 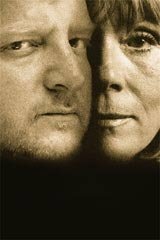 intheatre.com 1 February 1999, both reviews. backstage.com "Phedre" review. 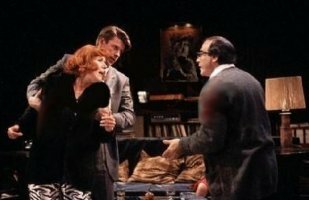 thestage.co.uk both reviews. This information was sent to me by a very dear reader of this site. Thank you, S.M. ! To all readers of this site: Has anybody one or some of the mentioned above issues ? 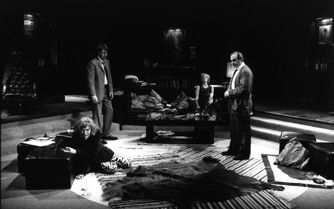 Ted Highes' translation of Racine's Phaedra, starring Diana Rigg and directed by Jonathan Kent, opened at Malvern and was transfered to the West End. This project reunited the team which created the award winning production of Euripedes' Medea. adapted by Ted Hughes, directed by Jonathan Kent, designed by Maria Björnson, lit by Mark Henderson, music by Jonathan Dove, presented by the Almeida Theatre. With Diana Rigg, Toby Stephens and Julian Glover. For all Diana Rigg's power, she is too calculating to be convincingly consumed by a sexual obsession, in love with Hippolytus her stepson. Björnson inspired design injects a dose of romanticism into the formality of Theseus' palace while Kent's production is stepped in an old-fashioned bravura. Most astonishing is Toby Stephens' chaste Hippolytus, whose pectorals quiver with horror when Phèdre confesses her love, but who's consumed by bashfulness when confessing his own love to Joanna Roth's excellent Aricia. Most affecting is David Bradley's simple account of Hippolytus' death. Suddenly Racine's tragedy moves well as impresses. 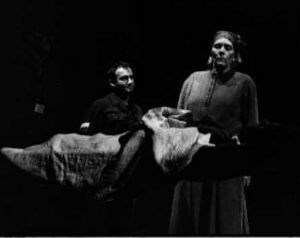 The first performance of Phèdre was at the Almeida's new festival for Malvern on August 6, 1998. 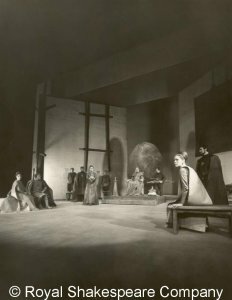 The first performance of this productuon of Britannicus was at the Albery Theatre on October 29th, 1998. 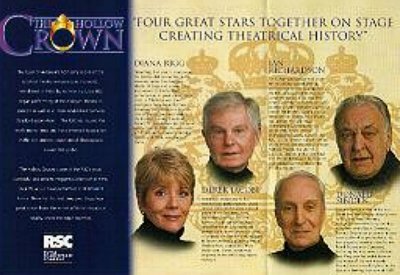 Performers Diana Rigg, David Bradley, Julian Glover, Barbara Jefford, Joanna Roth, Toby Stephens. Synopsis A tragic story of illicit love, guilt and desire of a mother for her stepson. "The West End had dared to be dangerous"
"Diana Rigg�.the most daring and magnificent performance of her career"
"Jonathan Kent's powerful and pulverising production"
"Toby Stephens' performance as Hippolytus is a revelation"
"Toby Stephens' Nero must surely be the best performance of his career to date." "I doubt if anybody could have predicted the blazing success of this extraordinary venture"
- an excellent site - english language - Best wishes and regards to Jackie Lane ! Stefan. 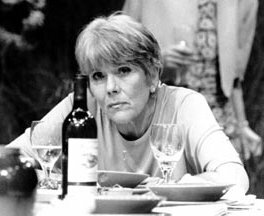 Dame Diana Rigg, 58, received the London Evening Standard Drama Award for Best Actress for her 1996 stage roles in Mother Courage and Who's Afraid of Virginia Woolf. The ceremony was held November 29th at the Savoy Hotel. The award was presented to her by Sean Connery. This is the second time in four years that Rigg has received the award. Paul Scofield was voted Best Actor for his title performance in the play John Gabriel Borkman. "They do say the profession gets increasingly difficult but my career seems to have been inside out, I'm playing the bigger parts now that I'm older," said Rigg. "That's probably right because I wasn't ready for them before so I'm grateful for them now." She added: "Stage work is very tiring and it eats into your life, so I'd like to do more television and films." 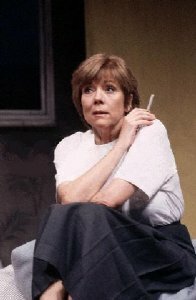 Rigg is currently garnering excellent reviews as "Martha" in Edward Albee's Who's Afraid of Virginia Woolf, at the Aldwych Theatre in London. Appearing opposite Rigg is David Suchet, who plays George. Suchet is best known to US audiences as Agatha Christie's "Poirot" on MYSTERY! The play premiered at the Aldwych on October 30th, and began regular performances on November 6th. Bookings are being taken through March 1997. 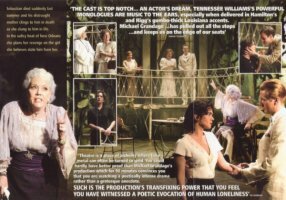 A review of the play is available at The London Theatre Guide. 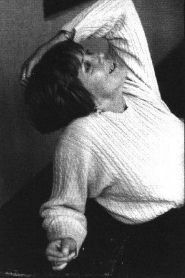 Rachael performed on stage for the National Youth Theatre in "The Odd Couple" (female version, 1997) and "Dancing at Lughnasa" (1998), both at the Arts Theatre in London. Diana Rigg and David Suchet (Poirot on TV's Mystery!) star in this major revival of Edward Albee's savage masterpiece. George, a middle-aged history professor (Suchet) and his wife, Martha (Rigg), invite a young couple over for a dinner, which quickly becomes a wild ride of darkly funny sarcasm, horrible revelations and scary mind games. 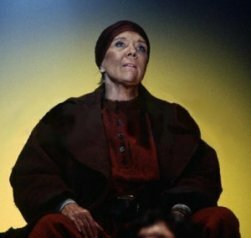 "After her triumphant Medea and...Mother Courage, Diana Rigg continues to stretch herself with what surely will prove a peak in an already impressive career. She is witty, devastating and, finally, moving...." (Time Out). "The best acting I have seen this year." (Irbing Wardle, Sunday Telegraph). Production: Who's Afraid of Virginia Woolf? In Partnership with AT&T.Evening Standard Award for Best Actress- Diana Rigg. 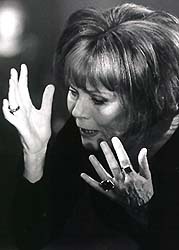 Diana Rigg in Brecht's Mother Courage, performed in London during the 1995/1996 season. 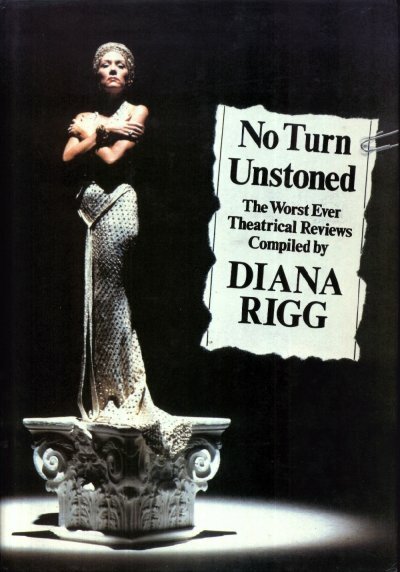 Evening Standard Award for Best Actress - Diana Rigg. Tony Award (see picture) for Best Actress. New York Drama Desk Award - Best Original Sound Design- John A. Leonard. The Variety Club Award for Best Actress- Diana Rigg. The Times Readers' Accolade for Best Actor or Actress in the West End-Diana Rigg. Transferred to Wyndham's Theatre, West End. "This intelligent, rigorously controlled production has delivered a powerful emotional punch." Again and again actors, directors and designers return to work at the Almeida. The pay is Equity minimum and the conditions backstage are basic. So why are we there ? Quite simply because the work comes first. April 9 - May 16, Royal Court Theatre, Sloane Square, London: Rosa: Berlin Bertie (Howard Brenton); Danny Boyle; Sandy: Kevin Allen; Alice: Penny Downie; Joanne: Susan Lynch; Berlin Bertie: Nicholas Woodeson. 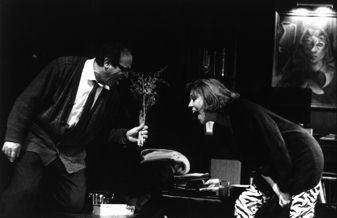 Berlin Bertie (Royal Court, 1992) is a play about the impact of the fall of the Berlin Wall in terms of uniting two sisters, both fleeing aspects of their lives, presided over by Bertie, a superannuated Stasi agent. Unusually for Brenton, this was a largely psychological study of their confrontation, based on a true-life story, and their final comic salvation is decidedly theatrical. In the early 1990�s the world was in turmoil, the Berlin wall had come down and similarly barriers of belief were breaking down all over Europe and the Middle East. Such is the setting for Brenton�s savagely funny psychological study of two sisters, one in flight from her adopted home in East Berlin, the other from the terrifying responsibilities of social work in London. And hanging over all is the sinister figure of �Bertie�, a superannuated Stasi agent. An Easter week-end of explosive confrontation ends in an oddly comic salvation. Based on a real life story researched by Brenton in Berlin and set in the midst of the shifting sands of social change, this is a play with stark resources ten years later. 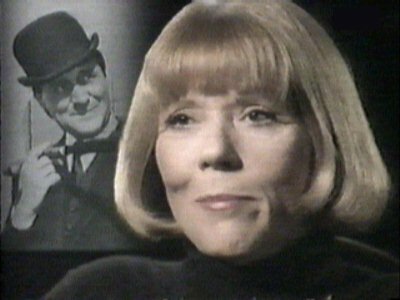 Dame Diana Rigg during an interview transmitted by channel ORF2 (Austria) in 1998. 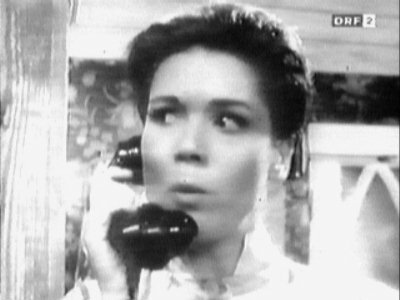 The picture with the phone (A171) is from The Hothouse, Armchair Theatre 1964. This information was sent to me on videotape by Gerhard, Vienna. Thanks a lot ! Directed and designed by Peter Brook. 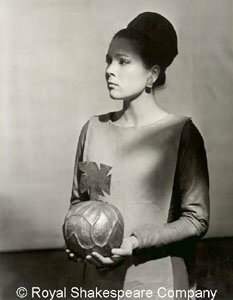 When Diana Rigg gave up RSC [Royal Shakespeare Company] for her role at the Avengers, her place at the RSC was taken by Glenda Jackson. Who says Glenda Jackson never wears make-up ? Cold, ball-breaking, indisputably regal, her Elizabeth was the apotheosis of a decade famous for its high-quality TV drama. "No Turn Unstoned"; 1982, publisher: Elm Tree, London. Humorous collection of stage reviews of fellow artistes. So To the Land ! Received Emmy for Outstanding Supporting Actress in a Miniseries or Special for "Rebecca" (1996/97). Received LONDON EVENING STANDARD Award for Best Actress for "Who's Afraid of Virginia Woolf?" (1996). 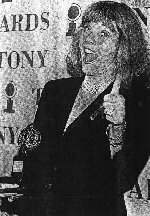 Received Tony for Best Leading Actress in a Drama for "Medea" (1994). 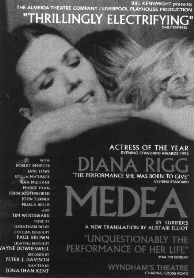 Received LONDON EVENING STANDARD Award for Best Actress for "Medea" (1992). Received Variety Club Award for "Evil Under the Sun" (1982). British award. Received PLAYS AND PLAYERS London Theatre Critics Award for Best Actress for "Phaedra Britannica" (1975). Tied with Helen Mirren in both "Teeth 'n' Smiles" and "The Seagull". [...] The Almeida is due to close for refurbishment in February 2001 and followers are obviously wondering what plans there are in place for re-location whilst the work is done. The Almeida was first opened in 1837 as the Islington Library and Scientific Institution. The premises comprised a lecture theatre, a library, a museum and a laboratoy. Over the years it has been used as a music hall, a Salvation Army citadel and a factory for carnival novelties. During the 1980's, in the course of a phased building plan, the Almeida became a 300 seat theatre taking full advantage of the existing architectual framework. A performance space was created where the relationship between artists and audience is at once heightened and intimate. In 1990 the Almeida Theatre Islington, North London, became a full-time producing theatre under the artistic leadership of Jonathan Kent and Ian McDiarmid, offering audiences a stimulationg environment for the performance of challenging seasons of classical and new plays, opera and new music. The Almeida is not confined by its bricks and mortiar. Projects such as the Almeida Theatre Company's Hackney Hamlet in 1995 paved the way for the Almeida's current development as an artistic nerve-centre with the aim of taking more of our work to more people. The Almeida has just established an annual summer residency in Worcestershire, providing a season of international drama in new Malvern Festival and is currently presenting a season at the Albery Theatre in the West End to run in parallel with the Almeida Islington. The Almeida's acclaimed production of O'Neill's The Iceman Cometh with Kevin Spacey, opens on Broadway in March 1999. The Almeida Theatre is the recipent of the 1998 London Evening Standard Award for the Achievment of the Year. The company regulary tours nationally and internationally and visited New York in 1994 with Medea (Diana Rigg - Tony Award, Best Actress) and in 1995 with Hamlet (Ralf Fiennes - Tony Award, Best Actor). Since 1990 the Almeida Theatre has won over 30 theatre awards including the 1993 Laurence Olivier Award for Outstanding Achievement. If you would like regular information about forthcoming productions we have a mailing list - �6 (�10 for non-European countries) for a year. Further details can be obtained from the box office on 0171 359 4404. We look forward to seeing you at the Almeida soon. 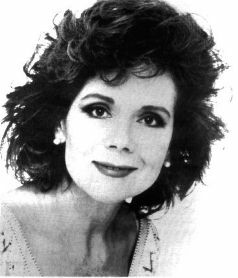 Hi Stefan, I just stumbled over your Diana Rigg website. Looks great, especially that it is dedicated to her stage proficiency rather than as one usually finds it to her Avenger's career. It's quite a curious story how I recently came across Diana Rigg. I am quite a fan of English literature, esp. English theatre, above all Shakespeare. In May I went once more to London to see some productions there (at the Globe and the Royal Heymarket). I happened to visit the London Theatre Museum. Part of the exhibition there was a section where they showed a video about the English stage and theatre history and scene; and, guess what, it was Dame Diana Rigg who appeared in that video talking with her beautiful, smooth and elegant pronunciation about the English theatre tradition, she actually guided through the whole video. It really struck me and made me remember the Avengers of the sixties when I was a teenager devouring these crime comedies quite unparallelled at the time. I suddenly realised that Diana Rigg has never been a great movie star although becoming famous by her Avengers role, and that she obviously has played quite an important role in the English theatre scene over the last 30 or more years. It was sort of eyeopener. It made me do some search on the internet. And here we are. I am sure, from now onI will keep an eye on her when looking for interesting things coming up in London or elsewhere. I never saw her live onstage, but now I would love to.